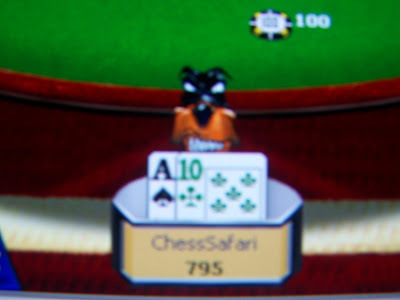 My name is Frank and I am a poker addict, More specifically, a PSO poker addict (the worst kind). So I thought I would come here and get therapy because it was either that or the asylum. I am divorced with four children including two girls in college. My oldest son and his wife are expecting my first grand child in November. Originally trained as a C.P.A. I was diverted into the health industry by a drunk driver who ended my dreams of competing in the 1972 Olympic Marathon. After a lengthy hospitalization and 19 operations on my legs I worked my way up the ladder from patient to hospital auditor to hospital consultant to Assistant Administrator to C.F.O. and eventually to the boss. It was a wonderful but challenging career which I had to put behind me after a stroke in 1997 at age 48. Following that I was coaxed to come out of retirement to serve as Executive Director of the United States Chess Federation from 2001 to 2003. An untimely heart attack made that situation untenable. So now I am writing a book, enjoying life's many gifts, and playing lots and lots of poker. 1. What is your previous poker experience? I have been playing poker longer than I can actually remember. My grandfather had a set of chips that I used to put in my mouth around age 4. So to show me what they were really for, he and my grandmother began playing draw poker (and later stud) with me way back then. In college, my fraternity brothers and I had weekend marathon sessions of 'man or mouse' (sometimes called 'guts'). Those games continued for awhile in home games but I was eventually enticed by another game: chess. I have played tournament chess for 35 years. In the meantime I spent a lot of time in casinos where I became competent at blackjack. So I played that game whenever I could...mostly at Foxwoods and in Vegas. I walked through the poker room at Foxwoods a dozen times without ever taking a seat; the lines were daunting I guess. I was eliminated in a hand with Men 'the master' Nguyen when I was ahead until...oh, you know (no bad beat stories from this guy). Anyway, Men the master went on to win $48,000 in the event. I was able, in the process, to sit next to him for nearly five hours and observe his tactics and demeanor. It was then that I knew for sure that this game was far more skill than luck! I spent the entire month of December 2004 in Tunica, MS playing poker 4-8 hours per day and played in at least three live tournaments per week while waiting for the PSO convention to begin. I won my first live poker tournament ($1,441) at the Grand on the Friday night before Christmas. Unfortunately, I slipped on some ice and disclocated my shoulder on New Year's Eve and had to return home to Connecticut. I missed the PSO convention and did not return to Tunica until January 2006. 2. What do you like most and least about poker? I enjoy the competition and am intrigued by the application of my chess skills: visualization, patience, planning ahead, pattern recognition... combined with my love of numbers. I hate the cards... sometimes. And I would prefer it if poker tournaments were played away from casinos (as they are with chess). No need to get into the reasons why. 3. What, in general, are you hoping to get out of my course? More skills for my bag of poker tricks; a clearer understanding; a more complete perspective; plug some leaks; make new friends. 4. If you could take away only one specific thing from this course, what would be the most important for you? Eradicate the weak part of my tight-weak self. 5. What is your table image when you play (tight, loose, aggressive, etc)? I just said it...tight-weak... and predictable. Easy to push off pots, but aggressive with good cards. I'm like a snapping turtle. 6. What opponent type gives you the most trouble? Same as what others have said: Aggressive players who can vary their play, adapt to my style, and read my damn cards. Those from PSO who come to mind: was, Mcarter, depraved, thehazyone, xymox and many others. Some are here...so I don't want to encourage them to take more advantage of me. 7. When you bet and an opponent raises you, how do you typically respond? Fold. Sometimes think for a long time, then fold. Occasionally I reraise. I rarely just call in this situation. Depends on the pot odds. 8. How often do you take notes on your opponents? Anyway, I took thehazyone's 4-week program in August 2005 and am astounded by how much I didn't know about big bet poker. Now that I am looking into the well I am wondering, "How deep is the well"? Please help, all of you, answer that question. With the help of my new best friend Stacey on PSO (RIVERHATER2) and at the suggestion of Scott (Marshfield), I became the moderator of the newest Study Group of PSO (founded 9/13/05...Stacey & hazy's birthday). I am so proud of the people in that group. There are some real budding superstars. I have determined that if I can get better at poker, then I can serve them better. That's important to me. So I am here. Of course if I can win a few bucks on the tournament trail and pick up a few tidbits for my book along the way, that would be nice also.